Founded in 1969, we are a group filled with members with varying interests, from field collecting to jewelry making. Explore the links to the left to discover what our club is about. We are members of the American Federation of Mineralogical Societies (AFMLS), Eastern Federation of Mineralogical and Lapidary Societies (EFMLS). 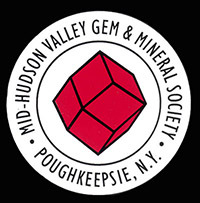 The Mid-Hudson Valley Gem & Mineral Society is a non-profit 501(c) organization.